Can I Eat My Special Diet While Climbing Kilimanjaro? When you think of climbing Kilimanjaro, the food you eat on your journey may be the last thing on your mind… unless you have a special diet. Whether you’re vegan or vegetarian, avoiding carbs and sugar, or have allergy restrictions, what you eat is usually one of your first considerations before taking on any new activity. After all, when you’re following this type of diet back home, making a drastic switch to adventure cuisine may be rough on your digestion, endurance, and overall performance. And that would definitely ruin your once-in-a-lifetime opportunity to reach the summit of Kilimanjaro. You can train for months, but if your diet isn’t right on the trail, your body won’t have the essential nutrients and energy it needs to thrive in this challenging environment. Why Is Diet So Important When Climbing Kilimanjaro? When you’re climbing Mount Kilimanjaro, food = fuel for your body. It’s like how gas powers a car. Carbohydrates give your body energy. Protein feeds your muscles and rebuilds the small tears you’ll make in them during long days of endurance trekking. Fat keeps you satiated and full between meals. 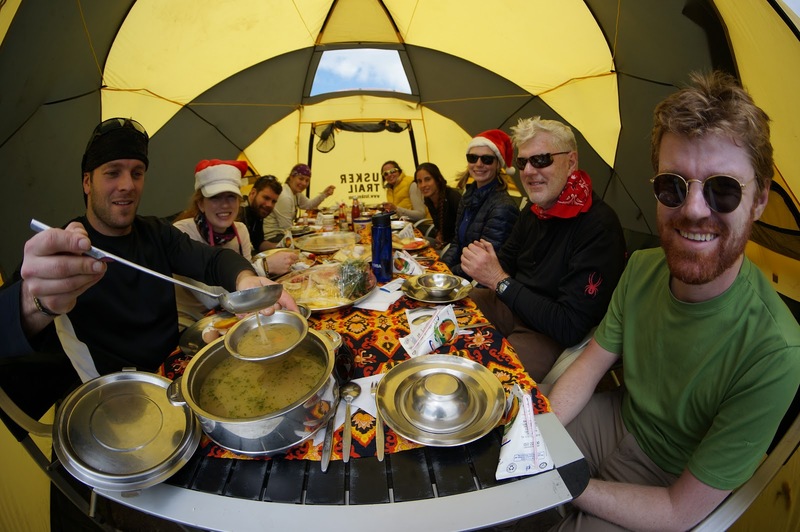 Built into the cost of climbing Mount Kilimanjaro, a few of the good climbing companies provide a healthy mix of these three macronutrients in the food they prepare for their travelers from arrival night through lunch on your final day. What Does Adventure Cuisine Usually Look (+Taste) Like? When you think adventure travel cuisine, you may think dehydrated food, small meals, and protein bars. That may be true for other companies, but Tusker elevates the experience with an incredible meal service prepared by professional chefs trained by the prestigious Culinary Institute Of America. The Culinary Institute also designs Tusker’s adventure menus, which are engineered for great taste, variety and specialized nutrition to keep hikers well-fueled for long days on the trail. 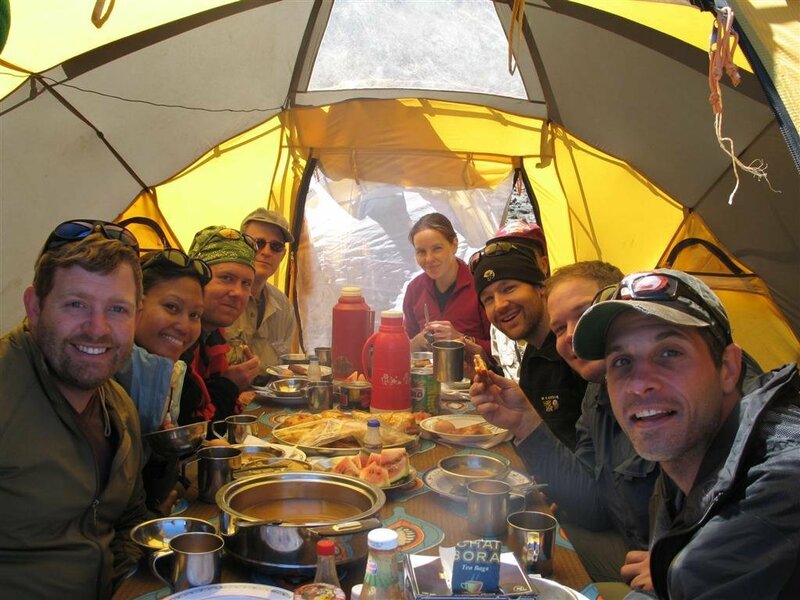 You’ll have hot breakfast and dinner every day while on Kilimanjaro; and a mix of hot lunch and picnic lunches. Notice any foods you can’t have or don’t normally eat? That doesn’t mean climbing Mount Kilimanjaro isn’t for you. What Should You Do If You Have a Special Diet? If you have a special dietary requirement, you’ll want to let your climbing company know as soon as you book your trek so there’s time to fine-tune a menu that’s optimal for your success. If you’re on a low carb, gluten free, or diabetic (low sugar) diet, your goal will be consuming enough fat and protein to keep your energy levels high. You’ll need to stay away from the bread, oats, fruit, starchy veggies, pasta, rice, and desserts on the trail that will spike your blood sugar or cause inflammation. So your menu may include more eggs, meat, low carb veggies, and cheese. On the other hand, if you’re used to carbs in your diet and prefer not to eat meat or animal products, like those on vegan and vegetarian diets, your goal will be keeping your blood sugar levels as stable as possible throughout your journey. When blood glucose levels dip, you’ll be more prone to headaches, fatigue, nausea, dizziness, and other signs of a sugar crash. Some of these overlap with symptoms of acute mountain sickness so you’ll need to pay extra attention to them. Your menu will be loaded up with extra carbs like sweet potato, porridge, peanut butter, fruit, salads, veggie stews, rice, and pasta instead. You’ll also want to alert your hiking company to any food allergies you may have, such as nuts, lactose, or gluten so they know before they figure out your menu. And if you abstain from certain meats or ingredients for religious reasons, don’t be afraid to share these dietary restrictions with them as well. You can also bring your own special snacks and foods in your daypack too. High altitude has a tendency to suppress your appetite yet many hikers say they grow hungry due to all the physical exertion and calorie-burning on the trail. The best way to fuel your body even when you’re not hungry is to pack snacks you love. This will make it easier for you to eat even when you feel as if you have no appetite. Similar to never hiking in new boots before your Mount Kilimanjaro climb, you also don’t want to pack any weird snacks your body isn’t used to either. The mountain is no place to test your tummy. 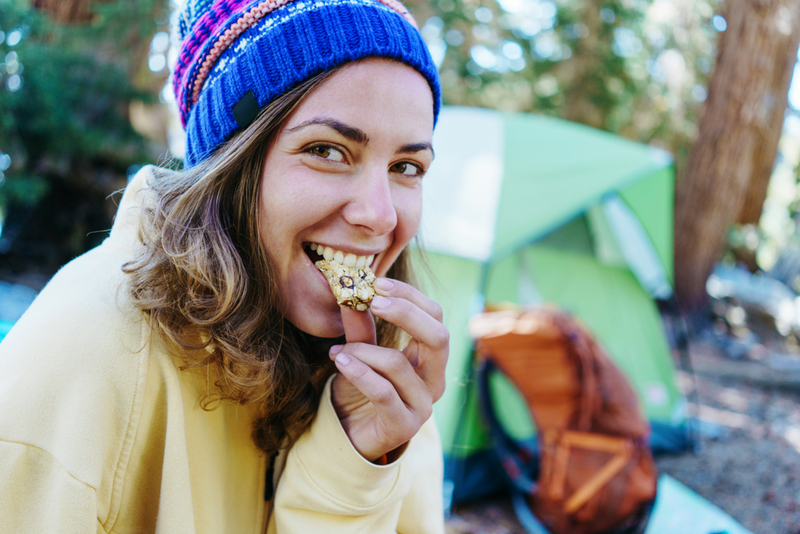 Plan to try snacks that you’re going to bring on your trek, in the weeks before your trip to see if they cause any ill effects. Nuts and trail mix. Nuts have a lot of fiber, protein, and energy and they won’t melt or freeze in your pack. Dried fruit and chocolate in trail mix will also add a pep to your step. Energy bars and protein bars with whey, nuts, nut butters, seeds, dried fruit, and other nutrients, as they are a convenient option for a snack on-the-go. Cheese, jerky and meat sticks are the protein-rich answer to convenient trail food when you’re going low-carb. Hard candies and gummies will keep your sugar levels up and add much-needed moisture to your mouth and throat, which can get dry as the altitude increases. You can find sugar-free versions of these too. Candy bars (especially Snickers bars) will refuel your glycogen stores (aka sugar reserves) to help you power through even the longest Kilimanjaro routes since they’re a winning combo of nuts, chocolate, sugar, and fat. Don’t feel guilty, you’ll be earning them. Optimal hydration is also necessary for your muscles and brain to work on Mount Kilimanjaro. So you MUST replenish the water your body will be losing via sweat on your hike. Electrolyte replenishers like powdered sports drinks, electrolyte mixes, and hydration tablets can be added to your water bottle to replace the electrolytes that may be getting flushed out of your system when you guzzle down water. These are better absorbed by your body than water alone so you’ll be able to replace both your fluids and electrolytes faster. With these tips in mind — and the help of your chefs — you can climb Kili without your restricted diet getting in the way of your dream. Travel with Tusker and you’ll sit down to delicious adventure cuisine in roomy all-weather dining tents equipped with tables, folding chairs, and gas lamps for warmth and lighting. If you have special dietary needs, just let us know ahead of time and we will prepare your meals according to your instructions. Specialty foods are not readily available in East Africa so you may want to bring specific ingredients you’re used to eating and let our chefs prepare them for you. Since this will require you to carefully plan and bring enough for every meal, you should contact our office and we’ll be happy to discuss this process with you. This is only one of the reasons why Tusker is the trusted name for climbing Kilimanjaro. Before you book your adventure, learn why first-timers and veterans choose Tusker Trail now!